It was only a matter of time. Blizzard has just put up a pair of in-game pets for World of Warcraft for sale on the Blizzard Store. 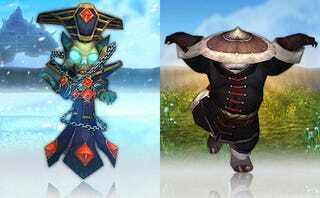 Would you pay $10 for a Pandaren Monk or a baby Kel'Thuzad? The two new non-combat pets now available for purchase at the Blizzard Store represent the first time actual in-game items could be purchased directly with real money outside of the World of Warcraft game proper. Lil' K.T. is a chibi version of everyone's favorite undead agent of the Lich King, Kel'Thuzad, while the Pandaren Monk is a...Pandaren Monk. The pets run players $10 apiece, with half of the proceeds of every Pandaren purchase going towards the Make A Wish Foundation until December 31st, after which the kids can just make their own wishes come true. Look for more pets to show up in the Pet Store in the coming months, and who knows? If this takes off, we could be witnessing the beginning of full-fledged World of Warcraft item store.